Does your little one love to play in the water? Well if they do then you’re definitely going to want to look at these great choices. These are each some of the best water tables that we’ve found. Each one is definitely going to offer some different features and make sure your little one enjoys the warmer weather. So take this water table buying guide and see which ones are going to be best for each of your children. Sand & Water: Some water tables are only about water while others are going to include both water and sand. This gives your child more to play with and makes it a whole lot more fun for the summer. Water Capacity: Different tables are going to contain different amounts of water, which is going to be related to what all the table is able to do. If there’s more to the table it will likely have more water. Pieces: Another aspect that’s related to what all the table can do is the number of pieces that are included. Different tables may have more or less pieces to provide even more fun for your child. Age: There are different age groups that may want different types of water tables. Knowing how old the child should be when they play with the table will help you choose the right one for your needs. Size: You may not want a table that’s too large because it may take up too much space in your yard, but you don’t want anything too small either because it’s not going to provide enough space for your child to play. Weight: The overall weight of the water table tells you how much it’s going to take for you to be able to move it around. Whether it’s full or not you want to be able to transport it to different areas for use. Your little one probably loves playing in the water, right? And they definitely love playing outside, but you want to find a way that they can safely do both of those things. That’s where a water table can come into play and each of these water tables is going to give you some great features. What’s even better is that you only have to take a look at our water table reviews to find what you’re looking for. 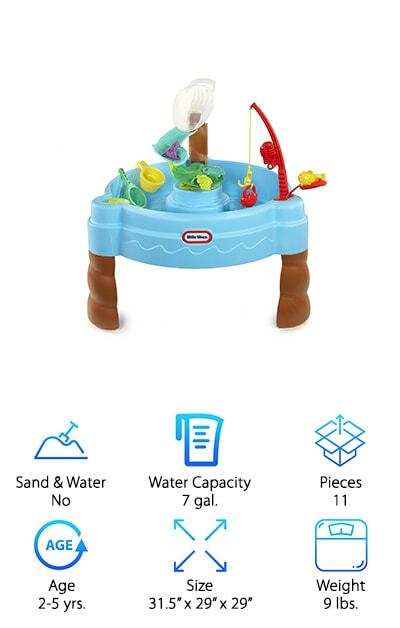 This Step2 Naturally Playful Center offers 2 different sides for your child to play in, one that’s filled with water and one that’s filled with sand. For us, it’s the best kids water table. Designed to be just the right height for your child to stand and play comfortably, it comes with 8 pieces that make it even more fun to play with. There’s even an umbrella that can keep your little ones from getting too warm or from the sun beating down on them too much while they play. When they’re done for the day you can just put the cover over the top and it stays clean and ready for the next time they want to come out to play. When you need to put it away for even longer you can even remove the legs so that it stores completely flat and entirely out of the way. It only takes a little adult assembly for your little ones to be playing once the table arrives. Our favorite budget pick is the Little Tikes Play Table, which offers a water table that has plenty of fun toys and pieces to play with. You’ll get a Ferris wheel as well as cups and funnels and even water wheels that will help your little one learn about cause and effect even while they’re playing and having fun. You get the water cup and 5 little characters as well as all the attachments already on the table itself so there’s plenty of fun to go around. Located just high enough that your little one can stand and play easily, this is the best cheap water table. The toys snap easily onto the sides so they can be moved around or even removed entirely if you want more water space and less of everything else. Your child can also add any of their favorite other water toys to the table. It’s great for any child 2 years and up. 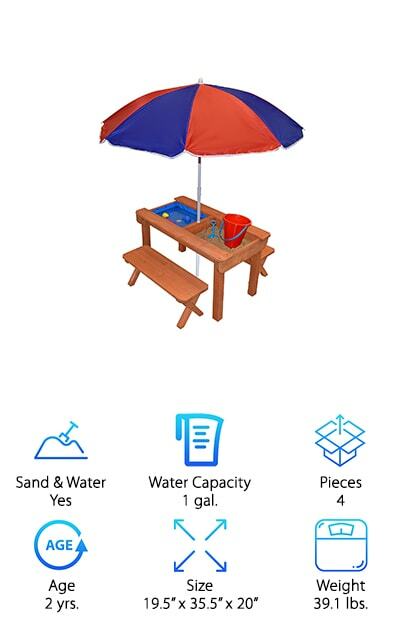 If you just want something super simple that’s still going to let your kids really enjoy playing in the sand and the water the ECR 4Kids Table is a great option. It’s actually 2 large buckets that are different colors and latched together so you can play back and forth between them. Even better, the legs can be adjusted to easily fit your child’s height and keep them comfortable while playing. There are different package options with larger numbers of stations or even different shapes of them too. You’ll be able to use these tables indoors or outdoors because they’re fade and weather resistant and can be some of the best water tables for sale. They’re certified to have minimal chemical emissions and have rounded edges that improve the overall safety. Great for preschoolers on up, they can help your little one learn motor skills and tactile discovery all at the same time. There are even lids to make sure that the tubs themselves stay clean and so does the area around them. 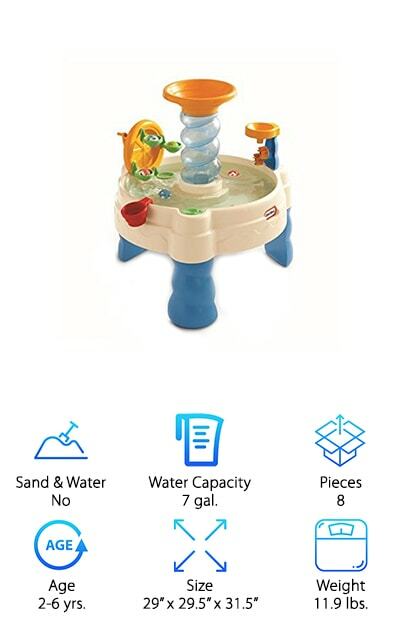 This Step2 Spill & Splash Water Table is made to really give your little one something to enjoy when the weather gets warm. It looks just like a pool for their fun water toys with a diving board and a swinging slide, plus they can cause a tidal wave from one side to the other. There are even several sea creatures to play around within the two separate tubs that are included. When it gets warm out you won’t have to worry about a thing because there’s an umbrella as well. 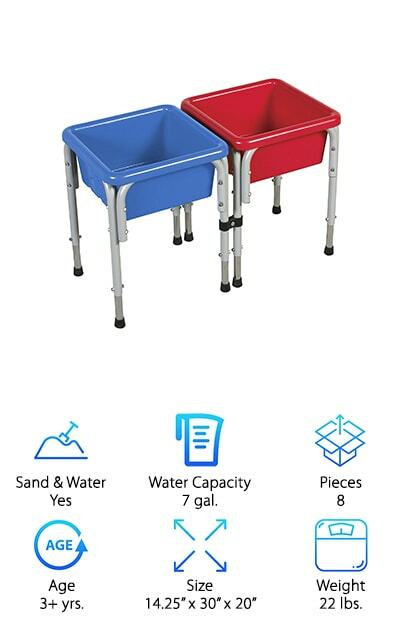 This table is the best water table for kids and actually has 2 different levels of play and it’s entirely made in the United States. Because of the design, it’s ideal for multiple children because everyone can get in and around the table just fine. Easy to assemble, it’s a toy that young children (and maybe even the older ones) are definitely going to enjoy throughout the summer. The Little Tikes Fish ‘n Splash Table makes fishing a whole lot more fun for your little one. This table has a fishing pole built right in and several little sea creatures that they’ll be able to ‘catch’ either with the pole or with one of the water cups that’s included as well. As they continue to fill up the bowl it will get heavier and heavier until it spills right over, dropping all their sea creatures back into the water again so they can start over. 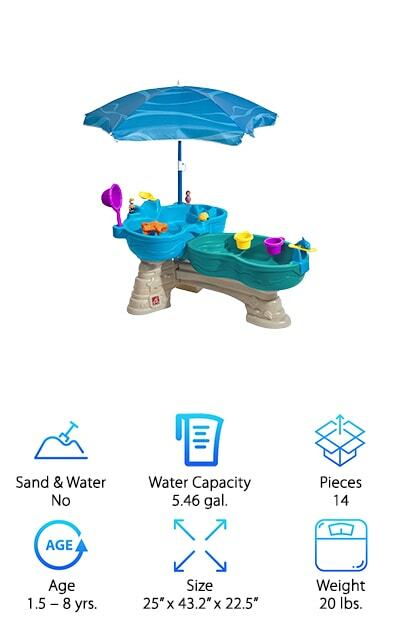 There’s even a launcher to fling creatures around this best water play table. There’s no need for tools to get this table all set up and it can even teach them fine motor skills while they’re playing, making it the best toddler water table. If you’d rather not use water at all you can actually fill it up with sand instead and your little one can use it entirely differently. The opportunities for use are definitely endless. The brightly colored Zooawa Fishing Table actually plays music and lights up, so your little one is going to have a really fun time. It’s set up as a game, with 2 separate magnetic rod and reel sets so that 2 children can try to catch all of the fun little sea creatures. Use all of the included pieces to create your own game or just play and have fun. It uses an electric water turbine as well as being made of eco-friendly, ABS plastic. This table lets your little one learn about color cognition, motor skills and a whole lot more, even while they’re playing and having a whole lot of fun. You’ll need batteries to keep it going, but this small table is definitely going to be more than enough for a small child who’s looking to have some fun outside in the hot sun and the warm weather. A little splashing around definitely makes for a great way to spend the summer. 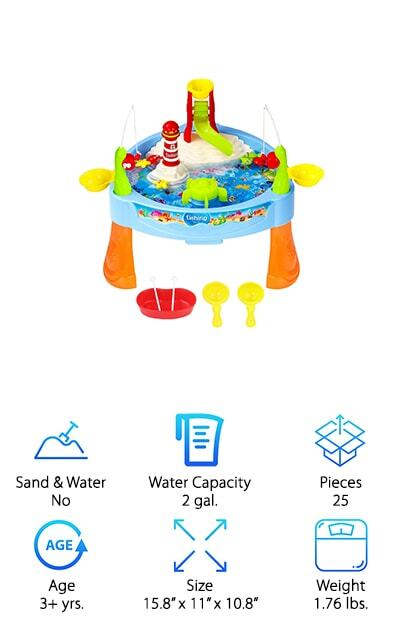 The Svan Sand and Water Table is great because it actually gives you several different features all in one. First, you get two basins that can be filled with water and sand. 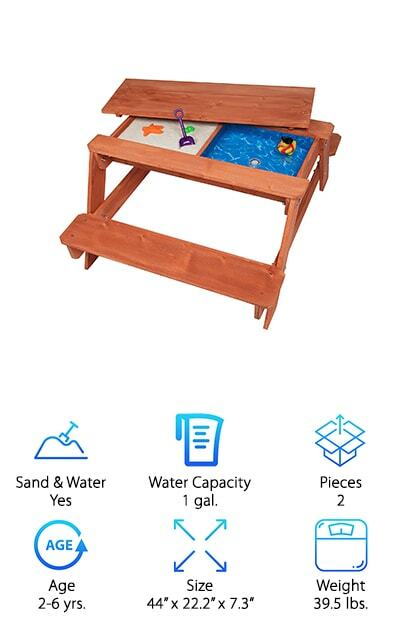 Then, you also get a beautiful wooden table that will provide a fun place for your child to sit and play either with the water and sand or with any of their other favorite toys. When they’re not using it for the tubs, you can put the top piece of the table on and they’ll be able to use it for anything else. This table looks great outside and no one will even realize what it is until you take the cover off to start playing. It holds just the right amount of water and sand for your little ones to have some fun without getting too much of a mess, and when you’re done you can either cover it or even drain it out. 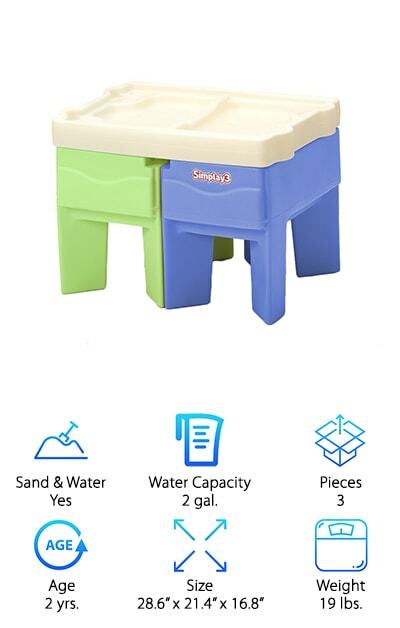 The Simplay3 Water Table actually has four separate sections that you can use for just about anything. You can slide the pieces closer together to take up less room when you’re not playing, but when it’s expanded it’s great for several children to play together with no problem. Fill up sections with water, sand or anything else that you want to encourage your child’s motor skills and a whole lot more. When it’s fully closed up your little ones can use this table for a number of different tasks because it has a flat side that can be used to write, draw or anything else you want, which makes it a great water table for older kids. You can even use the table indoors or outdoors, depending on the specific tasks that you’re looking to do. Just check it out for yourself and you’ll find a number of great ways to use it. 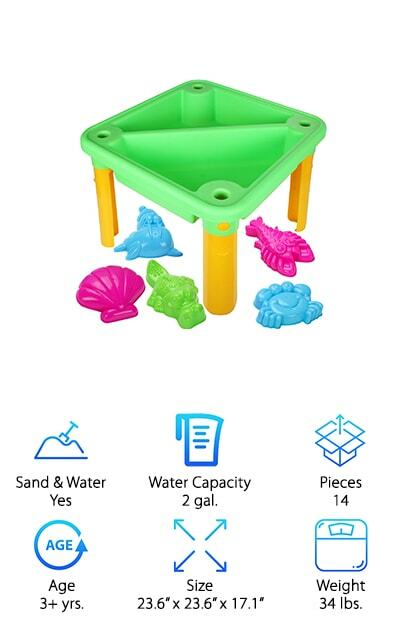 The Costzon Kids Table is entirely square but it has two sections so your little one can easily have fun with water and sand at the same time. It comes with several sand and water toys and it’s entirely non-toxic and heat resistant. You’ll be able to take it with you wherever you want as well because it’s really lightweight and it has drains on each side so you can fill it however you want and empty it quick and easy, whether at home or anywhere on the go. The 13 included accessories make it even more fun and when you’re ready to store it away you can simply remove the legs and it’s ready to go wherever you want. It’s easy to assemble without tools and even your child may be able to do it. Made with environmentally friendly materials, this table can be used by just about anyone for a whole lot of fun and becomes one of the best water tables for toddlers. Available in 3 different colors, the Back Bay Picnic Table is a great option for any yard and just about any child as well. Inside the table is a bin for each water and sand, so you’ll have plenty to play with. Each side of the table features a drain so you can drain them quickly and easily. When you’re playing you can sit at the included benches and put up the umbrella to keep your little one even better protected from the sun. 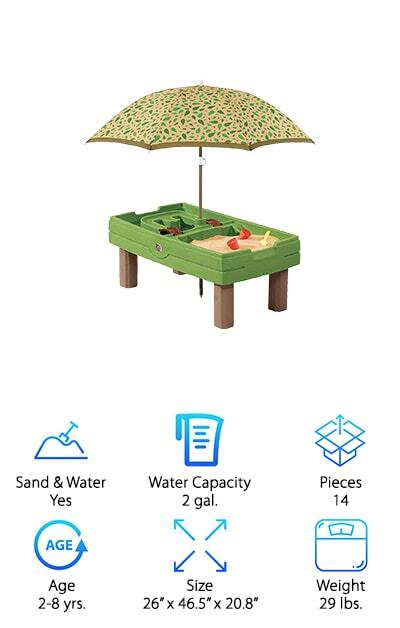 When you’re not using it there’s a cover that turns this sand and water table into a regular picnic table. Safe and durable, it’s the perfect size for up to 4 children to play on comfortably, whether they want to play on top of the table or in the bins underneath. You can get any kind of toys you want to play inside the table and children 2 and up will have plenty of fun with it.